Shown in Isager Strik Tweed, 50 g each: Winter Grey, Purple, Moss Green using US7 & 8. Size small. I designed Returning during a wild storm. 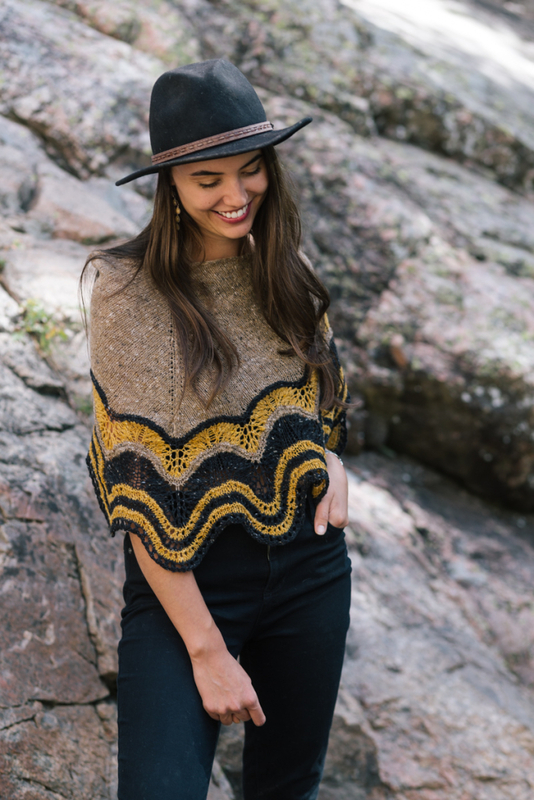 I was inspired by the heritage and beauty of the traditional hap shawls of the Shetland Island. I wanted to design something that was rustic, resilient but still delicate and beautiful. I really adore what came out of the process and I hope you do to. Shown in Geilsk Tweed, 50 g each: Fawn 5T, Black Bear 3T, Golden Ochre 27T using US7. Size small. needles required to reach gauge. larger than that required for gauge. * Regular and locking stitch markers. In stockinette, unblocked: 21 – 23 st / 4 in (10 cm). A variation in gauge of up to 0.5 sts/in is fine for this pattern. You will want a light and airy gauge that provides good drape and shows off the lace work.